Last week's Haynesville Shale rig count was down by three rigs to 24. 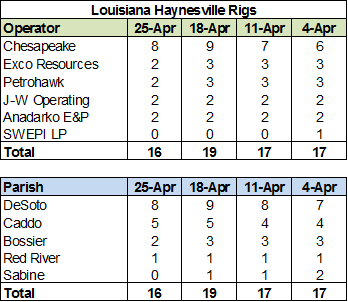 Louisiana was down by three rigs to 16 (Chesapeake, Petrohawk and EXCO down one each), while Texas was unchanged at eight. EIA reported that working gas in storage was up 49 Bcf to 899 Bcf. The weekly injection was 63% greater than last year (+30 Bcf) but in line with the five year average (+47 Bcf). The current storage level is 48.0% below last year (1.73 Tcf, a difference of 831 Bcf) and 52.9% below the five year average (1.907 Tcf, a difference of 1.008 Tcf). Over the past two weeks since I've last reported, the Haynesville rig count has gone up by two rigs to 27. Texas was pretty much unchanged over the period, holding at eight, while Louisiana saw three new rigs from Chesapeake, while SWEPI (Shell) dropped its last rig to end at 19. Suddenly it feels like old times again with Chesapeake operating three times more rigs than anyone else in the play. The Baker Hughes U.S. rig count was unchanged this week at 1,831. 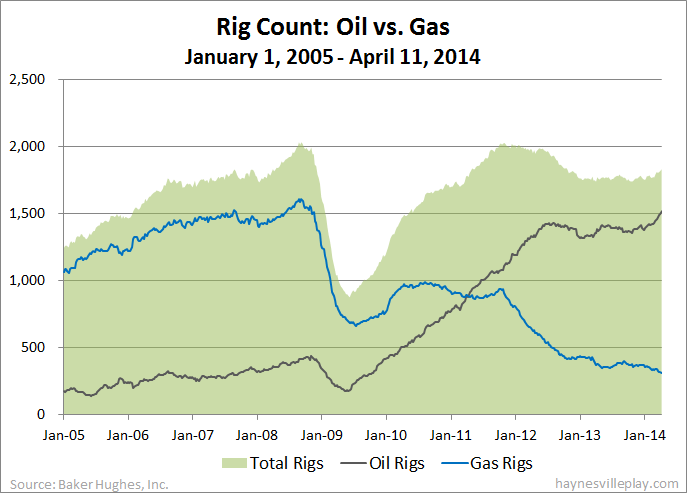 Oil rigs were down seven to 1,510, gas rigs were up six to 316 and miscellaneous rigs were up one to five. By type, there were no changes (?!?) with horizontal rigs holding at 1,224, vertical rigs at 391 and directional rigs at 216. Among gas rigs, horizontal rigs were up two to 233, directional rigs were up two to 54 and vertical rigs were up two to 29. And yes, I am behind on my Haynesville rig counts. The kids are out this week for spring break so I haven't had time to deal with it. I'll do two weeks together by the start of next week. 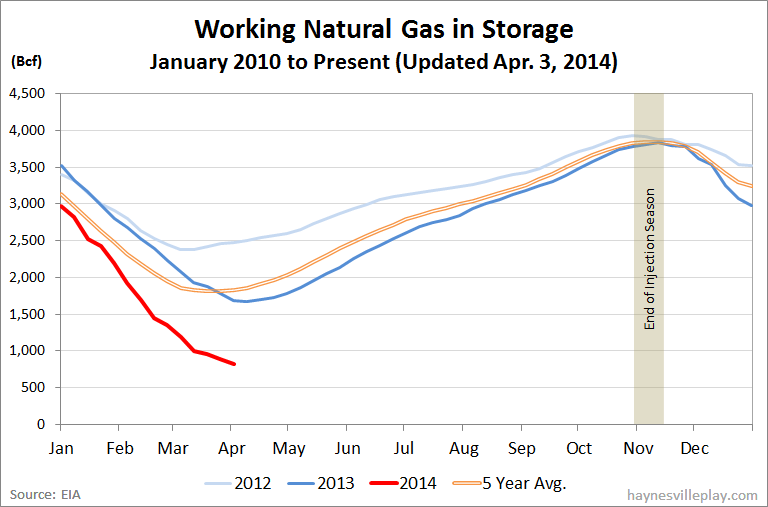 EIA working gas in storage was up 24 Bcf last week to 850 Bcf. The weekly injection was inline with last year (+25 Bcf) and 35% below the five year average (+37 Bcf). The current storage level is 50.0% below last year (1.7 Tcf) and 54.3% below the five year average (1.823 Tcf). The current storage level is now exactly 1/2 of last year's level and 1.01 Tcf below the five year average. You probably won't see that again in coming years! The Baker Hughes U.S. rig count was up 13 to 1,831. Oil rigs were up 19 to 1,517, gas rigs were down six to 310 and miscellaneous rigs held at four. This is first time oil rigs have broken the 1,500 barrier, and it is the highest level ever recorded on the BHI records (beginning 1987). By contrast, the gas rig count hasn't been this low since May 21, 1993. By type, horizontal rigs are unchanged at 1,224, vertical rigs are down two to 391 and directional rigs are up 15 to 216. Among gas rigs, horizontal rigs were down five to 231, directional rigs were up three to 52 and vertical rigs were down four to 27. The EIA reported that working gas in storage was up 4 Bcf last week to 826 Bcf. This is the first net injection since mid-November and, if it holds, marks the end of the winter withdrawal season. This week last year saw a 25 Bcf withdrawal, but the current injection was largely in line with the five year average, which was up 9 Bcf. The current storage level is 50.7% below last year (1.675 Tcf) and 54.7% below the five year average (1.823 Tcf). Some moldy oldies at the top of the list from Sabine O&G. These two Dinkle wells were originally permitted in late 2010 and drilled in early 2011. They seem to be going through some old inventory in Harrison Co. Sabine completed two older Harrison wells in October and August 2013. The last non-Sabine well to be completed in Harrison was completed in March 2013. EOG is getting in on the liquids action. Both of their completions reported liquids, including one >100 Bbl/day. The Haynesville Shale rig count was down two rigs last week to 25. Louisiana was down two (both Chesapeake) to 17, while Texas held at eight. The Baker Hughes overall U.S. rig count was up nine rigs this week to 1,818. Oil rigs were up 11 to 1,498, gas rigs were down two to 316 and miscellaneous rigs were unchanged at four. By type, horizontal rigs were up 13 to 1,224 (the highest level ever), vertical rigs were up nine to 393 and directional rigs were down 13 to 201. Among gas rigs, horizontal rigs were unchanged at 236, directional rigs were down two to 49 and vertical rigs were unchanged at 31. 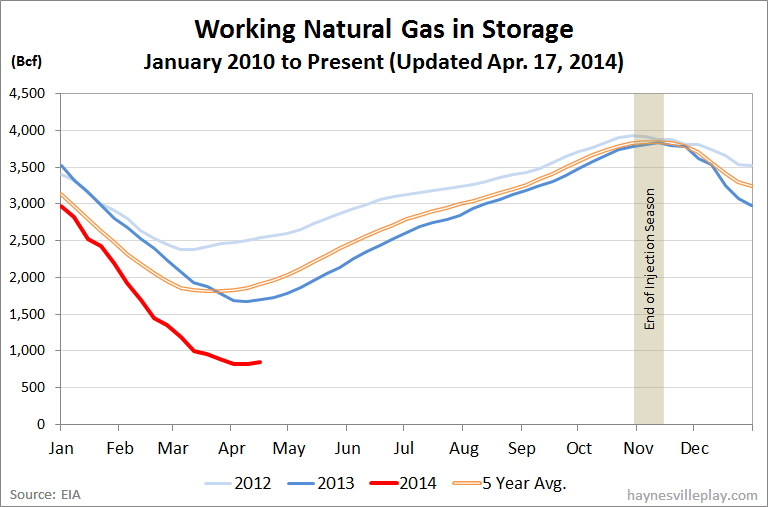 The EIA reported this morning that working gas in storage was down 74 Bcf last week to 822 Bcf. The weekly withdrawal was actually 22% lower than last year (-95 Bcf) but nine times greater than the five year average (-8 Bcf). The current storage level is 51.6% below last year (1.7 Tcf) and 54.7% below the five year average (1.814 Tcf).